These images and movie demonstrate the behavior of the Gray-Scott reaction-diffusion system with σ=Du/Dv=2 and parameters F=0.1100, k=0.0550. 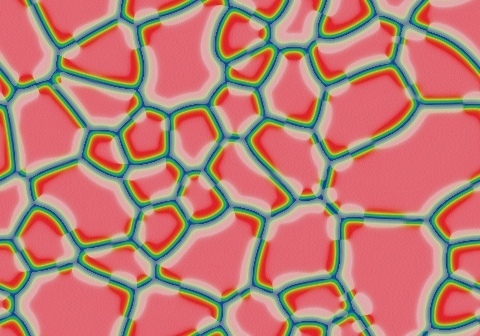 Red spots on blue grow into "bubbles" whose boundaries have surface tension; bubbles with a small number of edges shrink while others grow, until a hexagonal pattern is reached. Surface tension is notably greater here than to the immediate west, and the bubbles coalesce more quickly.